Undoubtedly, the biggest news Wednesday from CES was about the show itself, with a two-hour power outage at the Las Vegas Convention Center making international headlines and turning major companies snarky on Twitter. Call me a bit surprised that rain was enough to cause this, as it’s not uncommon for Las Vegas in January — desert locale notwithstanding — to be caught in torrential downpours. This made me curious about power generation in Las Vegas, as CES must consume an insane amount of power, and all of that is happening alongside major light shows on the Strip and Downtown Las Vegas. (Perhaps the saving grace: CES is daytime, whereas the light shows happen at night.) One hotel alone has the brightest light beam in the world, which draws 351 kilowatts in operation, and is visible to aircraft up to 275 miles away. The best comparison I could find to judge Las Vegas power usage is that the percentage of the U.S. population who live here (1.3 million, or 0.40%) is lower than the percentage of local power generation (4.4 gigawatts, or 0.46%). That extra 0.06% is 5.8 gigawatts, which is enough for over four flux capacitor-powered trips through time. The power outage didn’t affect me, because I spent part of the day recuperating from a cold, and the rest at Eureka Park, a breakout section of the show at the Sands Convention Center. Most years, Eureka Park has the highest ratio of cool things seen to miles walked, and this year was no exception. All companies demoing in Eureka Park are startups, but that doesn’t mean their products are less likely to ship than those shown on the main floor. Many of the booths here were part of a “pavilion” sponsored by a country, city, or university, indicating that they’re backed by a business development network helping them get off the ground. 7NEXT PUP Portable Scanner — This is one of those CES gadgets that would be really useful at CES. 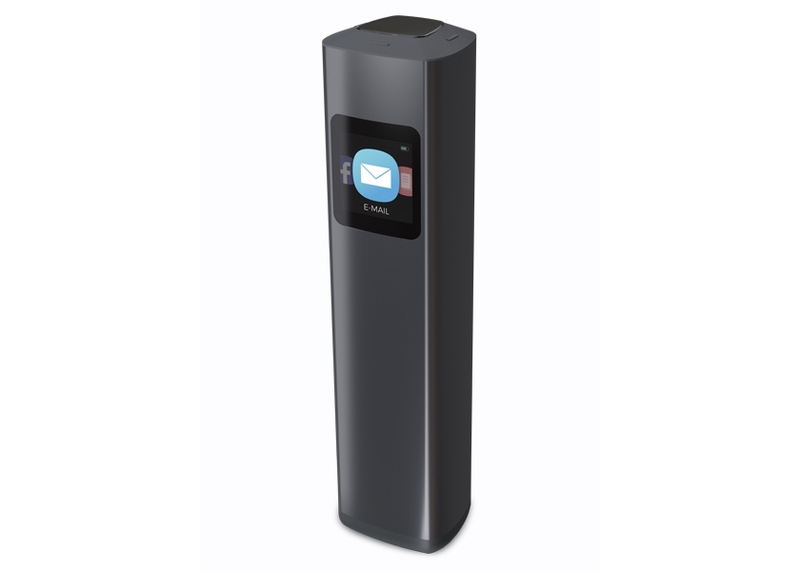 The PUP is a handheld portable scanner that you point at a document you want to scan. The clever bit is that it fires a grid of visible red lasers at the document, so you can be sure it’s getting everything and is lined up correctly. The PUP connects to Wi-Fi, and a small color display shows you the destination of the image, which can be stored on the device, transferred across a network, or piped to a service like Dropbox or email. A battery charge is good for over 2000 pages. Shipping in April 2018 for $389; note that the Web site says it’s good for all metric size formats, which implies they haven’t yet added U.S. paper sizes. Wanderwatch Kids’ Smartwatch — Your kid is too young for their own phone, and an Apple Watch is too expensive and complicated. 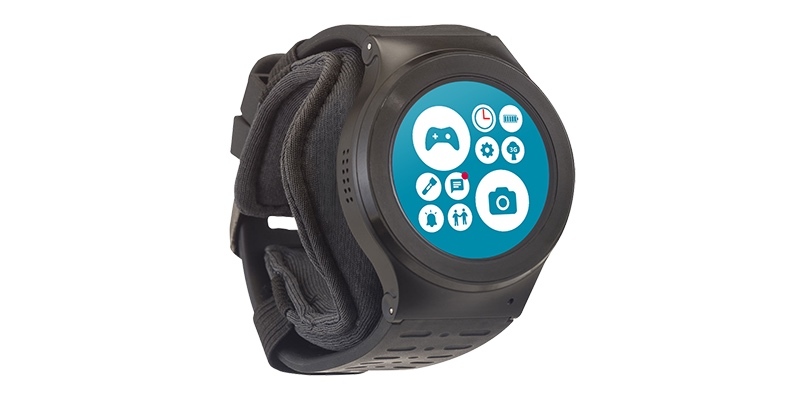 For such tots, there’s the Wanderwatch, a smartwatch designed for children and also to keep parents in the loop. It has built-in games, but they’re geared to getting your kids out and about — kids are supposed to play with it, not on it. Built-in Wi-Fi, GPS, and 3G keep kids connected to parents; everyone communicates by scribbling icons back and forth. Wanderwatch sips data; you buy prepaid blocks in $25 chunks from T-Mobile, and the Wanderwatch folks figure you might have to do so three times a year. Shipping now in “limited quantities” for $199. 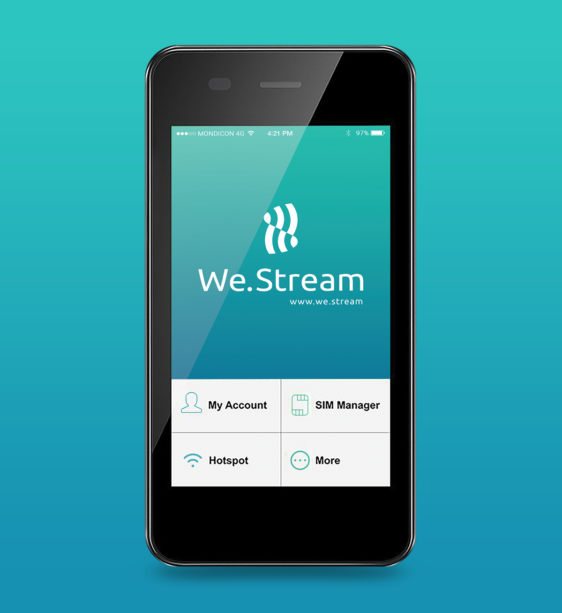 We.stream Global Tethered Hotspot — The We.stream is an idea that’s been knocking around for years: a global cellular modem you can use to get online in over 100 countries, with up to 150 Mbps of bandwidth. The $179 We.stream doubles as an external battery for your phone, lets you insert your own SIMs or uses cloud SIM technology while roaming, and is notable for having a built-in VPN that ensures that your data is always encrypted. 2 GB of data per month is included, after which speeds are throttled to 128 Kbps for the rest of the month. You can also purchase additional one-off 30-day data plans for $99 (2 GB), $199 (5 GB), or $299 (10 GB). Most interesting, however, is the $399 plan that provides unlimited global data for 1 year; order in the first month to get it for just $249. Available now. And yes, the We.stream looks a lot like an iPhone SE in a cellular-equipped case. SignAll Sign Language Translator — Google Translate, as impressive as it is, can’t handle American Sign Language. SignAll, currently in testing at Galludet University (a school focused on the education of deaf and hearing-impaired students), is a system of four cameras that watches signed communication and translates it into English. Next on their agenda: an on-screen avatar to provide translation in reverse. Future plans include refinement of handling of ASL dialects, and expansion to include other international kinds of sign language. Not yet available to the public, but SignAll is soliciting applications to the pilot program. PocketConfidant Virtual Coach — PocketConfidant is an AI chatbot designed to replicate the experience of talking to a personal success coach. Your company, organization, or community signs up and provides PocketConfidant to its employees, members, or citizens. Each such group sets its own parameters for the coaching goals it wants individuals to achieve, but once that’s done, the conversations each person has with the AI are kept secret from the sponsoring agency. Conversations take place in private chat channels you may already be using, such as Slack or Facebook Messenger. The press materials have an example starting with, “I feel really low at work today,” with the AI asking for more details, but they don’t document the kind of answers one might expect. The coaching philosophy is to help the person find their own answer, rather than give advice; I’m not sure what that means in practice. You can sign up for a free trial to see if you want to try it with your group. Wiidii Personal Assistant — For more open-ended assistance with day-to-day life, there might be Wiidii. People have been dreaming of a 24/7 AI personal assistant for decades; Apple took a memorable crack at the idea with the Knowledge Navigator concept video in 1987. Wiidii claims to be shipping something similar, although via a text conversation rather than the full avatar-in-a-bowtie experience. It uses a combination of AI with human concierges filling in when the problem is too much for software to handle. For that reason, I’m not entirely skeptical when Wiidii claims to provide a wide variety of services with natural language processing, but I wonder what the mix is. Too much human help, and the service won’t scale, won’t be profitable, or will cost a boatload. No word on pricing because it’s aimed at companies that will provide it to their employees. Diabilive Insulin Calculator — Being an insulin-dependent diabetic is not easy: take too much or too little insulin, and life-threatening complications can result. The prevailing method of measuring a dose — guessing based on how you feel — leaves much to be desired. MirambeauAppCare’s Diabilive promises a better method: fire up this mobile app and enter your blood sugar level, and it will give you the precise insulin dosage based on your profile. Add the food you’ve eaten today, and your planned upcoming physical activities, and it adjusts accordingly. Planned for September 2018 release for $20 per month, but that schedule depends on timely FDA approval. e-Vone Senior Monitoring Shoes — CES was replete this year with senior-assistive technologies, and I was expecting several to make my cut for coverage. But most missed the mark: either a technology that I thought would be offputting (such as various robots, not known for their acceptance by seniors), or unwieldy and single-purpose. You can buy one of several hip-mounted airbags to protect you from falls (if they work; I saw a painful-looking live demo that didn’t), but do you really want to constantly wear a device that protects you from just one particular danger? e-Vone shoes aren’t protective, but their technology has the advantage of being unobtrusive to the wearer. Embedded sensors in the shoes detect falls and contact designated support people, including family or emergency services. This is an improvement over various in-home monitoring systems, as the shoes go where you do. The shoes rely on a network that came as news to me, called NarrowBand IoT; e-Vone claims it works in 120 countries, and T-Mobile will be rolling out nationwide later this year, with plans for only $6 a year. The shoes, which come in a range of styles, will cost a bit more: €30 a month for shoes and service, or €120 up front and €20 a month. As you might guess from the Euro denomination, it will launch in Europe in September 2018 (although in theory shoes purchased there should work elsewhere); U.S. sales are two years away. 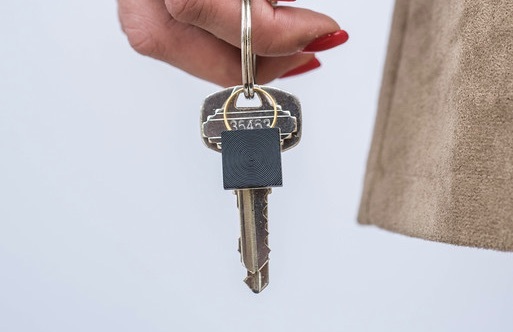 Ripple Safety Wearable — Alternatively, skip the shoes and wear a Ripple Safety 🎁. It’s a button that’s smaller than a penny, which you can clip to clothing or carry in your pocket. Clicking the button contacts a live 24/7 team through your phone, via Bluetooth. A triple click generates an emergency alert, and they’ll follow the instructions you’ve set up in your phone in advance. But the brilliant idea is the company’s non-emergency service: click the button once, and they’ll immediately call you back and stay on the line as long as you like; for example, while you’re walking to your car by yourself after dark. If anything goes awry (or hopefully, before it does), they’ll know immediately and call you whatever help you need. $19 for the button and $10 per month for the service, which includes a free replacement button every 6 months when the battery is scheduled to die. If you cancel the service, the button still works to send an alert message and your location to your friends. Invi Nonviolent Defense Bracelet — Even if you have a 24/7 phone buddy, if something bad happens, you’re still waiting for help. I’ve been attacked a few times, and I’ve been hurt; every time, I haven’t even thrown a punch in self-defense. Just not something I’m willing to do. For folks like me, there’s the Invi bracelet. It’s filled with a liquid that gives off an awful aroma when it hits the air; I asked what it smells like, and the rep said it was literally indescribable. The idea is, anyone attacking you is going to rapidly find somewhere else to be. The downside: it costs €70 a pop, and it can be used only once. That said, I expect there’s a psychological benefit to wearing one, even if you never use it. The bracelet has a safety button to prevent accidental discharge. Available now with free worldwide shipping. 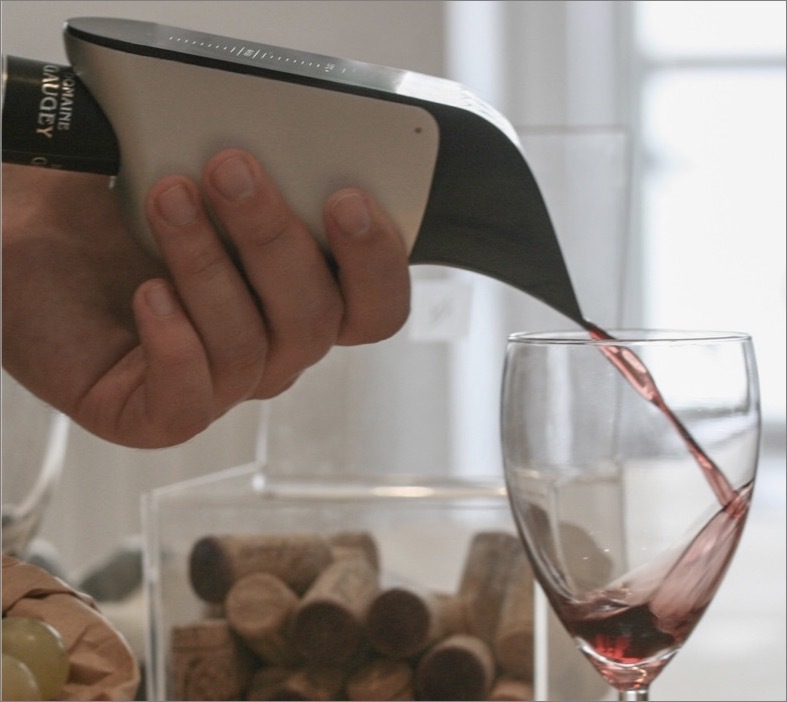 Aveine Wine Aerator — Call me uncouth, but I had no idea wine drinkers had so many problems, whether it’s preventing deterioration after a bottle is opened (see “CES 2018: CES Unveiled Gives a Duck,” 9 January 2018), or ensuring that just the right amount of air hits the wine on the way to the glass. (Can you imagine if Coke was as fiddly?) I was skeptical of the pricey 10-Vins D-Vine aerator last year (see “CES 2017: Gadget Finds on the CES Show Floor, Days 3 and 4,” 11 January 2017), but Aveine’s Aveinologie is closer to the sweet spot. It works with any bottle you own; scan the label with the device, and it knows the proper amount of air it needs. Then there’s none of that “let it breathe for four hours.” Just attach the Aveine to the bottle and pour for instantaneous aeration. $100 via Kickstarter in March 2018, with an anticipated $200 price tag in June. This perhaps raises a dilemma for the oenophile as to which gadget to use: a Coravin lets you sample a glass, but presumably without aerating the wine; an Aveinologie gives you the right gas mixture, but be ready to demolish the bottle in one sitting. Cauldryn Multipurpose Travel Mug — If you’ve ever thought to yourself, “this travel mug is fine, but it can’t make margaritas,” Cauldryn has you covered. The Cauldryn V2 🎁 series is an insulated 16-ounce travel mug that takes various accessories, including a blender, coffee percolator, or battery to keep your beverage at a precise temperature. Or you can recharge your phone with your coffee, which has to be the first time that sentence has been written. A digital readout and blinking lights communicate what’s going on inside the mug. The Cauldryn V2 series will be available late this year, ranging from $130 to $150 depending on which accessories you buy with the mug. Additional accessories range from $15 to $30, and Cauldryn expects to have more by the time it ships. 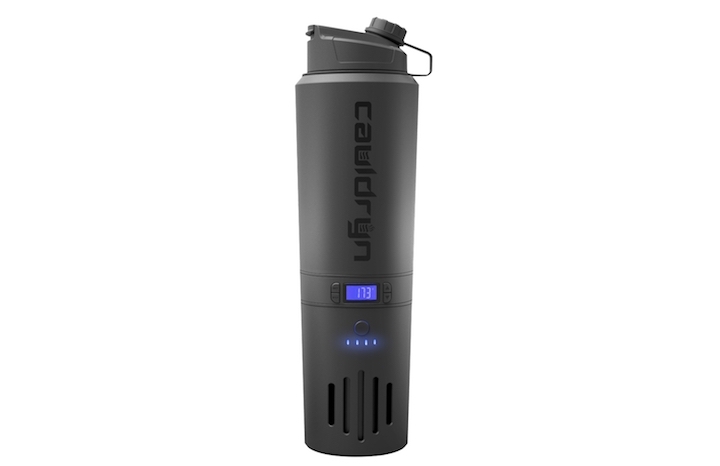 Until then, you can make do with the $140 Cauldryn V1, which is a water heater/battery/AC adapter without the modular functionality for the additional units. 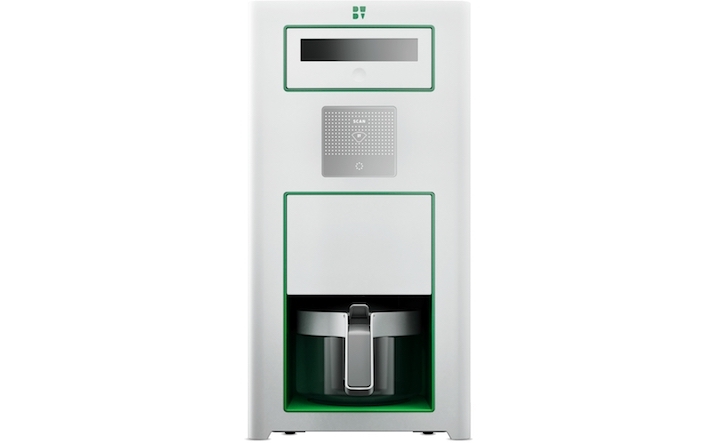 Bonaverde Coffee Maker — Speaking of coffee, Bonaverde claims its Berlin coffee maker can make you a better cup, because it starts with green coffee beans, roasts them, grinds them, and serves you a pot of coffee in 15–20 minutes. In theory, this allows you to buy unroasted beans and keep them forever, because they don’t start to go stale until after they’re roasted. Supply your own, or buy Bonaverde’s RFID-equipped bags for $1–$2 each, which will instruct the Berlin on the correct way to treat the beans. The booth representative said the bags would provide 5–7 pots of coffee, but note that the Europeans think a “pot” is 40 ounces, and that’s “five cups of coffee,” whereas I think of 40 ounces as “a single serving.” I tried a sample, and it tasted like a decent cup of coffee, but nothing to make me rapturous. Then again, most connoisseurs think my Starbucks habit has strip-mined my taste buds. $799, available now. VR Timetravel Augmented Tours — In the category of “really interesting AR examples,” there’s VR Timetravel from Digital Devotion Group. You know those tour buses that take you around major cities to tourist spots that are littered with souvenir kiosks? VR Timetravel is designed for people on those buses; you still go places, but at any time you can put on the helmet, and see how the things you’re looking at appeared centuries ago. Currently on trial in sections of Luxembourg, the company’s hometown. If this ever includes the States, I’d tour Philadelphia and Washington wearing it in a heartbeat. 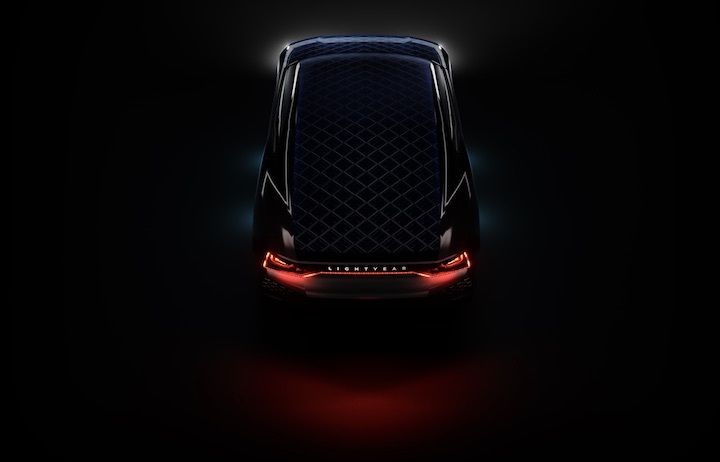 Lightyear One Solar-Powered Electric Car — Verging into “I’ll believe it when I see it” territory is the Lightyear One, an electric car that claims to recharge from a solar panel roof. This doesn’t fit with what I’ve heard about how much power you can generate with that kind of square footage, but Lightyear claims you can go months without charging the battery. Details are nearly entirely lacking, but Lightyear was founded by five alumni from Solar Team Eindhoven, a student team that won the practicality judging in Cruiser Class in the 2017 Bridgestone World Solar Challenge, while completing a 3000 kilometer course from Darwin to Adelaide. So they know what they’re doing, at least in the prototype world. Lightyear expects to produce the first 10 cars in 2019 for €119,000 and suggests that they’ll build another 100 cars in 2020. Based on the Blade Runner-esque deep shadows of the photography, they’re probably none too clear on the final look of the car. 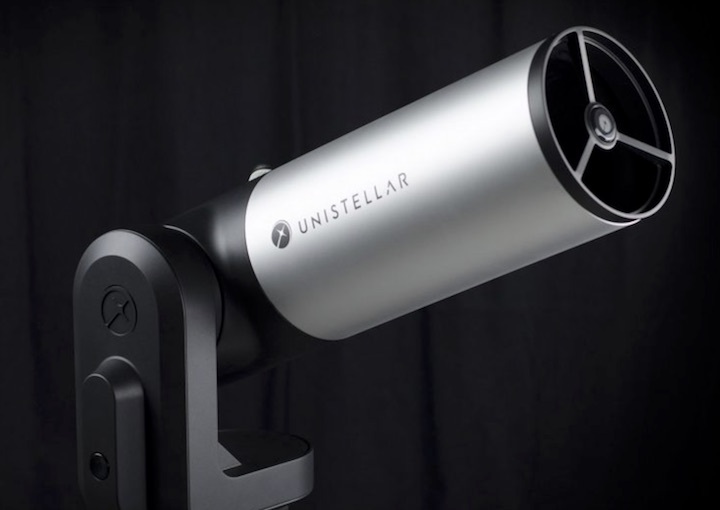 Unistellar eVscope Augmented Telescope — I was psyched about the Unistellar eVscope telescope last year (see “CES 2017: Gadget Finds on the CES Show Floor, Days 3 and 4,” 11 January 2017), because an automated motorized telescope that optionally overlays augmented reality data so what you see matches processed NASA images, is just damned cool. It’s still not shipping until early 2019, but presales begin in March 2018 for $1600 for this portable scope — it weighs 15.5 pounds (7 kg) including tripod. See the site for technical details about the telescope that I’m not qualified to explain. Unisteller has set up a nifty partnership with the SETI Institute to add objects to the database of what the eVscope can identify live, and to allow people to join in on crowdsourced science projects. Hushme Voice Privacy — We would all like a technological cone of silence to keep our calls private and be courteous to others in public spaces. I just don’t think anyone is willing to look like Hannibal Lecter 2049 to do it. Apparently Hushme agrees; I’m using the booth photograph because their Web site shows product pictures, and a guy with one resting on his neck, but no one actually using one. And if “youngsters” (youngsters? really?) actually use this for fun, well, sign me up early for my AARP card, because I don’t understand kids today. If you’re not yet thoroughly dissuaded, the details: other people can hear you’re speaking, they just can’t tell what you’re saying. A combination of active sound cancellation and optional white noise makes your conversation less intrusive to others. Currently on Indiegogo for $189, but note the “estimated delivery date” of December 2017; neither my press materials nor my booth conversation indicated whether they’ve started shipping. Schluss Identity Privacy Platform — As a guy who’s been into computer privacy issues since the 1980s, and who thinks we’ve been losing ground ever since, Schluss is my cup of tea. The plan: rather than leaving a data trail everywhere you go online and turning over tons of identity data permanently to every company you rub shoulders with, instead you use a Schluss identity. The Schluss platform lets you designate which parts of your personal data are open by default and which private information a particular company may access. The upside for the company is that you keep your identity information up-to-date (it’s smart to do so, as outdated information is an identity theft risk), so they have a cost-free method of having your data as needed. The second upside: as Schluss grows, they want this privacy control model enacted in regulatory legislation, such that Schluss-compliant companies would get regulatory approval “for free,” literally and figuratively. Why trust Schluss? Because they don’t have customers, they have members; governance will be cooperative. (The Dutch founder used this term the way an American might say “nonprofit,” but I don’t know if that’s a legal designation.) Signing up members now, fees will be “minimal;” the initial aim is to make just enough profit to keep it going. Shleep Personal Sleep Plan — As soon as CES ended, I started spending long stretches of quality time with my pillows, and really got my hotel money’s worth. For others who don’t get enough shuteye, there’s the Shleep personal sleep planner. (Another product that was a guaranteed booth visit on the basis of a great name.) Shleep is an app for iOS and Android that runs you through a questionnaire to come up with a personal sleep plan to get you better rested and sends you a daily 5-minute video on how to get better sleep. The first video is titled “Break up with your snooze button,” because while those extra twenty winks might feel like more sleep, you don’t get much benefit when you’re woken up every 9 minutes. Now available for $10 a month or $72 a year, with promotional pricing for an unspecified duration and a discount for early adopters. >visible to aircraft up to 275 miles away. Next time I travel to the desert to experience the stars, remind me to make sure I'm at least 300 miles from Vegas. Sheesh. "On a clear night, the Sky Beam is visible up to 275 miles (443 km) away by aircraft at cruising altitude, such as over Los Angeles."